proficient understanding of your individual requirements. Our competitive rates, our service guarantee and a comprehensive range of forklift makes and models to suit all applications, ranging from the smallest walk behind electric through to 6 ton industrial models, make Hire-A-Forklift your preferred choice. Find out more about our long and short term forklift hire with option to purchase. Please contact us via the form below or call us on 1300 729 077 and our forklift hire team member will get back to you with a free quote. 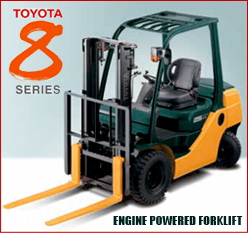 Our large range of forklifts that we hire includes most of the latest models of Toyota forklifts. For detailed technical specification please click on the brands below.